Paul Feig’s all-female Ghostbusters reboot has generated plenty of controversy amongst ghost purists and general woman-haters alike, but of all the side noise so far, the latest is perhaps the most bizarre. 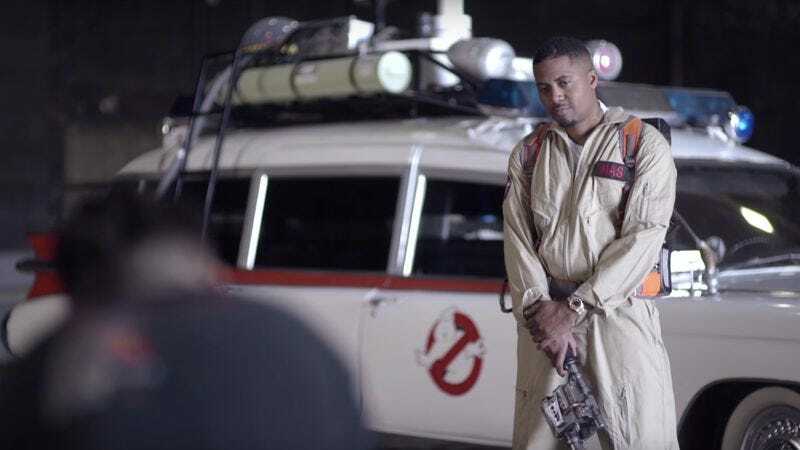 HYPEBEAST reports that Nas, noted rapper and apparent fan of the supernatural, has revealed his HSTRY clothing line is teaming up with Ghostbusters to launch a batch of apparel inspired by the franchise. In a short video accompanying the announcement, Nas explains the partnership with universal truths like, “Ghostbusters is every fun thing you can think of, you know, when it comes to the imagination” and “what kid doesn’t get inspired or intrigued by ghost stories?” Plus he’s more “business-minded” these days, so with a Ghostbusters pinball machine and Lego set already on the way, it was just a matter of time before he got in on the merchandising action. The film doesn’t hits theaters until July 15, so here’s Nas talking about his clothing line to tide you over until then.